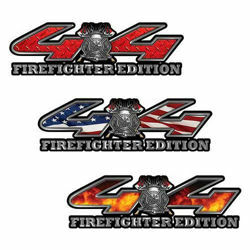 4x4 firegither edition decals with fire axes for your truck or SUV. We took an older design and revised it to look even better. Giving you more color choices and highly detailed vivid colors thoughout the graphic. These work great for Personal Vericles, Grass or Brush Rigs or any 4x4 vehicle you want to turn into a emergency response vehicle. Designed and manufactured exclusivly by Weston Ink using the the higest quality materials and a high tech manfacturing process. 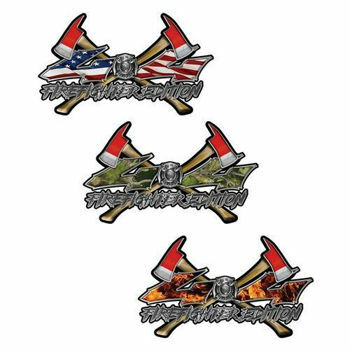 Using the the latest printing technology with a 7 color process these graphics are vivid in color and are highly detailed. New inks and processes also extend the life of the graphic for years to come without any fading making your vehicle look good rain or shine year around. This product has reflective options. The Reflective option is produced from the same materials used on emergency vehicles, our reflective products look just the same as the non reflective designs during the day but at night when light hits them they reflect all the colors in the graphic grabbing your attention. With our special 7 color translucent ink reflective process all the color within the graphic reflects. It's a great attention grabber for your vehicle as well as a great safety feature at night.